Evidence on non-steroidal anti-inflammatory drugs (NSAID) use and breast cancer risk shows a slightly protective effect of these drugs, but previous studies lack randomized clinical trial results and present high heterogeneity in exposure measurement. This systematic review and meta-analysis widens the knowledge about NSAID use and breast cancer risk, updating the information from the last meta-analysis, focusing on evidence on specific effects of COX-2 inhibitors and differential expression patterns of hormonal receptors. 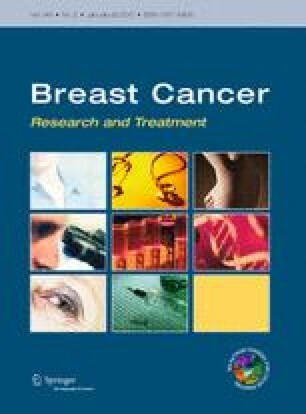 A PubMed-database search was conducted to include all entries published with the keywords “BREAST CANCER NSAID ANTI-INFLAMMATORY” until 10/24/2013 providing original results from cohort studies, case–control studies, or randomized clinical trials with at least one reported relative risk (RR) or odds ratio (OR) on the association between any NSAID use and incidence of invasive breast cancer. This resulted in 49 publications, from which the information was retrieved about type of study, exposure characteristics, breast cancer characteristics, and breast cancer-NSAID association. Meta-analyses were performed separately for case–control and cohort studies and for different hormone-receptor status. NSAID use reduced invasive breast cancer risk by about 20 %. A similar effect was found for aspirin, acetaminophen, COX-2 inhibitors and, to a lesser extent, ibuprofen. The effect of aspirin was similar in preventing hormone-receptor-positive breast cancer. This meta-analysis suggests a slightly protective effect of NSAIDs-especially aspirin and COX-2 inhibitors- against breast cancer, which seems to be restricted to ER/PR+tumors.